The ARCHI database has found 240 archaeological sites within 10 km of , Newent, Gloucestershire. Data from British Archaeological Records, Historic Sites and Monuments Databases, Local History Sources, Metal Detecting and Treasure Hunting Reports and Archaeology Research Reports. Archaeological Site Distribution Maps showing the locations of the archaeological sites listed are available by subscribing to the ARCHI UK database. Click the 'Subscribe' button below to subscribe to ARCHI UK. Click HERE if you require further information on subscribing to the ARCHI UK Archaeological Sites Database. 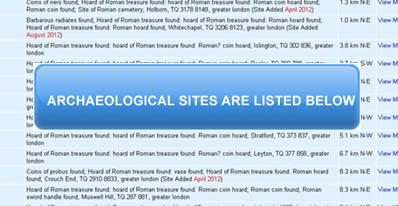 The sites within your search area are listed in the table below. If you wish to view more precise positional information (ie UK National Grid References / co-ordinates) and also see maps of the sites right away, you can subscribe to the ARCHI Database (£34.95) by clicking the PayPal SUBSCRIBE button above. ARCHI has found within 10 km of , Newent, Gloucestershire 40 Roman archaeological / historic / ancient sites and monuments. See below for details of these sites. Data gathered from old ordnance survey (OS) maps, tithe maps, field names, aerial photographs, reports of antiquity findspots, archaeological excavation, research of old and historic documents and by archaeologists, field walkers, metal detecting detectorists, treasure hunters and local historians and reports from local history associations and historical societies. Roman sites within 10 km SO7225 Archaeology and Ancient History of Newent, Gloucestershire, British National Grid Reference: SO7225; E-N: 372000 225000; Decimal Latitude/Longitude: 51.922809, -2.408559 View Old Victorian Ordnance Survey 6 inch to 1 mile Map 1888-1913 of , Newent, Gloucestershire. Note: Four figure National Grid Reference Numbers such as TQ 12 34 are accurate to the root axis co-ordinate of the corresponding 1km Square of the British National Grid Referencing System. The exact locations of the archaeological sites listed in the table above are available by subscribing to the ARCHI UK database. Click the 'Subscribe' button below to subscribe to archiUK. If you would like to learn more about some of the types of archaeological sites and finds listed above, then click the links to Wikipedia below. Download the ARCHI Discover Archaeology Android App. Click ---here---- to find more UK Archaeological Sites. ARCHI has found within 10 km of , Newent, Gloucestershire 1 Romano-british/Iron Age / Celtic archaeological / historic / ancient sites and monuments. See below for details of these sites. Romano-british/Iron Age / Celtic sites within 10 km SO7225 Archaeology and Ancient History of Newent, Gloucestershire, British National Grid Reference: SO7225; E-N: 372000 225000; Decimal Latitude/Longitude: 51.922809, -2.408559 View Old Victorian Ordnance Survey 6 inch to 1 mile Map 1888-1913 of , Newent, Gloucestershire. ARCHI has found within 10 km of , Newent, Gloucestershire 9 Anglo-Saxon archaeological / historic / ancient sites and monuments. See below for details of these sites. Anglo-Saxon sites within 10 km SO7225 Archaeology and Ancient History of Newent, Gloucestershire, British National Grid Reference: SO7225; E-N: 372000 225000; Decimal Latitude/Longitude: 51.922809, -2.408559 View Old Victorian Ordnance Survey 6 inch to 1 mile Map 1888-1913 of , Newent, Gloucestershire. ARCHI has found within 10 km of , Newent, Gloucestershire 14 Iron Age / Celtic archaeological / historic / ancient sites and monuments. See below for details of these sites. Iron Age / Celtic sites within 10 km SO7225 Archaeology and Ancient History of Newent, Gloucestershire, British National Grid Reference: SO7225; E-N: 372000 225000; Decimal Latitude/Longitude: 51.922809, -2.408559 View Old Victorian Ordnance Survey 6 inch to 1 mile Map 1888-1913 of , Newent, Gloucestershire. ARCHI has found within 10 km of , Newent, Gloucestershire 20 Bronze Age archaeological / historic / ancient sites and monuments. See below for details of these sites. Bronze Age sites within 10 km SO7225 Archaeology and Ancient History of Newent, Gloucestershire, British National Grid Reference: SO7225; E-N: 372000 225000; Decimal Latitude/Longitude: 51.922809, -2.408559 View Old Victorian Ordnance Survey 6 inch to 1 mile Map 1888-1913 of , Newent, Gloucestershire. ARCHI has found within 10 km of , Newent, Gloucestershire 76 Medieval archaeological / historic / ancient sites and monuments. See below for details of these sites. Note site co-ordinate is a four figure British National Grid Reference Co-ordinate. Medieval sites within 10 km SO7225 Archaeology and Ancient History of Newent, Gloucestershire, British National Grid Reference: SO7225; E-N: 372000 225000; Decimal Latitude/Longitude: 51.922809, -2.408559 View Old Victorian Ordnance Survey 6 inch to 1 mile Map 1888-1913 of , Newent, Gloucestershire. ARCHI has found within 10 km of , Newent, Gloucestershire 11 Post-Medieval archaeological / historic / ancient sites and monuments. See below for details of these sites. Post-Medieval sites within 10 km SO7225 Archaeology and Ancient History of Newent, Gloucestershire, British National Grid Reference: SO7225; E-N: 372000 225000; Decimal Latitude/Longitude: 51.922809, -2.408559 View Old Victorian Ordnance Survey 6 inch to 1 mile Map 1888-1913 of , Newent, Gloucestershire. ARCHI has found within 10 km of , Newent, Gloucestershire 16 Mesolithic archaeological / historic / ancient sites and monuments. See below for details of these sites. Mesolithic sites within 10 km SO7225 Archaeology and Ancient History of Newent, Gloucestershire, British National Grid Reference: SO7225; E-N: 372000 225000; Decimal Latitude/Longitude: 51.922809, -2.408559 View Old Victorian Ordnance Survey 6 inch to 1 mile Map 1888-1913 of , Newent, Gloucestershire. ARCHI has found within 10 km of , Newent, Gloucestershire 6 Neolithic archaeological / historic / ancient sites and monuments. See below for details of these sites. Neolithic sites within 10 km SO7225 Archaeology and Ancient History of Newent, Gloucestershire, British National Grid Reference: SO7225; E-N: 372000 225000; Decimal Latitude/Longitude: 51.922809, -2.408559 View Old Victorian Ordnance Survey 6 inch to 1 mile Map 1888-1913 of , Newent, Gloucestershire. ARCHI has found within 10 km of , Newent, Gloucestershire 5 Unclassified ancient archaeological / historic / ancient sites and monuments. See below for details of these sites. Unclassified ancient sites within 10 km SO7225 Archaeology and Ancient History of Newent, Gloucestershire, British National Grid Reference: SO7225; E-N: 372000 225000; Decimal Latitude/Longitude: 51.922809, -2.408559 View Old Victorian Ordnance Survey 6 inch to 1 mile Map 1888-1913 of , Newent, Gloucestershire. ARCHI has found within 10 km of , Newent, Gloucestershire 3 Unclassified historic archaeological / historic / ancient sites and monuments. See below for details of these sites. Unclassified historic sites within 10 km SO7225 Archaeology and Ancient History of Newent, Gloucestershire, British National Grid Reference: SO7225; E-N: 372000 225000; Decimal Latitude/Longitude: 51.922809, -2.408559 View Old Victorian Ordnance Survey 6 inch to 1 mile Map 1888-1913 of , Newent, Gloucestershire. ARCHI has found within 10 km of , Newent, Gloucestershire 3 Industrial archaeological / historic / ancient sites and monuments. See below for details of these sites. Industrial sites within 10 km SO7225 Archaeology and Ancient History of Newent, Gloucestershire, British National Grid Reference: SO7225; E-N: 372000 225000; Decimal Latitude/Longitude: 51.922809, -2.408559 View Old Victorian Ordnance Survey 6 inch to 1 mile Map 1888-1913 of , Newent, Gloucestershire. ARCHI has found within 10 km of , Newent, Gloucestershire 36 Tithe map data archaeological / historic / ancient sites and monuments. See below for details of these sites. Tithe map data sites within 10 km SO7225 Archaeology and Ancient History of Newent, Gloucestershire, British National Grid Reference: SO7225; E-N: 372000 225000; Decimal Latitude/Longitude: 51.922809, -2.408559 View Old Victorian Ordnance Survey 6 inch to 1 mile Map 1888-1913 of , Newent, Gloucestershire. Any material supplied from this database, for example, the above list, is protected by copyright. No part of the supplied material may be reproduced, stored in a retrieval system, or transmitted in any form or by any means, electronic, mechanical, photocopying, recording or otherwise, without prior permission of the copyright holder (Digital Documents). Applications for permission to reproduce any part of the material should be addressed in the first instance, to Digital Documents, 10 Ormeley Road, Balham, London, SW12 9QE, UK. This information is presented for the benefit of those who wish to enjoy and further understand the British countryside. The provision of the sites on this list does not mean that they are necessarily open to the public or that any visible evidence remains. Permission should always be sought before going on to private land. The lists generated from ARCHI do not indicate which sites are protected by Scheduled Ancient Monument legislation. This is a temporary page. To keep a permanent copy of these results either make a print out of this page or choose SAVE AS.. from the FILE menu. Click ---here---- to perform another search. Click ---here---- to go to the homepage.